Jacinta and I have just bought our first farm in South West Victoria after share farming for many years. It’s a temperate climate with high rainfall (850mm average annually) and winter pugging can be a problem. Feeding silage and vetch hay in the paddock meant that wastage and pasture damage in winter was a big problem for us. We have opted at this stage for an earthen feedpad with concrete troughs. In the future, we will consider a fully concreted pad. 1. We worked closely with our farm consultant and nutrition adviser on this project. Having an extra sounding board and people to check our financial assumptions was invaluable. 2. It’s really important to think about how the new infrastructure layout will affect cow flow. 3. If you are going to do staged developments like us, have a plan for what you do with your initial infrastructure. For example, once we get a fully concreted pad, our earthen one will become a calving pad. This way we are still extracting value from our initial investment. We’ve share farmed with our own pure-bred Holstein herd for many years, and inherited some Jerseys along the way. We like cows milking to their full potential. Since purchasing and moving to this farm eight months ago, our first focus has been getting the nutrition right for cows to maximise their production potential. We are keen to do this without compromising the business focus on profitability and growing quality pasture. We split calve so managing and providing feed all year round is really important to us. 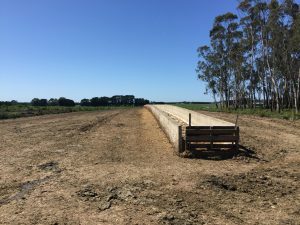 This farm has the potential to be quite wet, so we wanted the capacity to feed cows extra but keep them off the paddocks to minimise pasture damage and feed wastage. We are aiming to improve pasture and fodder production so that we can increase milking numbers to 600 head on the same foot print. The whole system has worked better than anticipated from a durability perspective – some maintenance is still required to top up some gravel soft spots that occurred at the end where mixer wagon turns around. With hindsight, I’d make the mixer wagon turning circle area larger on the end of the feed pad. 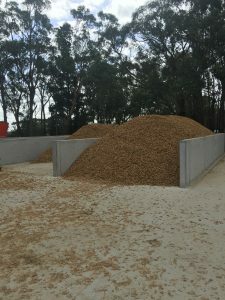 The intention is still a future concreted feed pad to increase durability and reliability in extreme wet conditions, and I’m currently pondering the location. Most likely the earthen pad will become a calving pad. We experienced an instant change – significantly reducing the feed wastage, and from the 480 milking herd, production went up by 800 litres a day. With feed at $300 per tonne and milk price at 45-50 c per litre, this equates to around $900-$1000 per day for us. The down side is making sure the feed is on the pad before cows enter – this means an extra hour in the evening after milking but this is better than getting up even earlier to put feed out before getting the cows in for morning milking! We explored the feed pad options with our farm advisor and looked at various local ones. While I would have liked to go down the path of concrete, we weren’t in a financial position to afford the $400K expense. We compromised, putting in a 108m gravel pad with 30 concrete troughs down the middle (3.6m x 1.2m). I relied on the local contractor experience for the design, and the whole process took 2-3 months. The cows were on the new pad by June 2015. We actually found sandstone in the base of a dam and moved this for $4 per cubic metre (total 200m 3 ). This cut our costs considerably as we would have had to pay $28 per m 3 to truck it in. All up, we spent around $90K, including $18K on the concrete troughs. We also purchased a new mixer wagon for $75K + GST. The mixer wagon is on the smaller side for the number of cows we milk, but the 32 cubic metre one stretched the budget too far!